Sigx • View topic - Getting Started: A Pictorial Tutorial made simple! Getting Started: A Pictorial Tutorial made simple! Post subject: Getting Started: A Pictorial Tutorial made simple! Step 4: if you want to use themes, pick one from the drop down box. if you want to use apple theme, select one and go back to apple. Step 5: after theme is selected you will see a preview of it and the code to go along with it. copy (ctrl+c) the code. There are two codes, one is html and the other is BBCode which is used by most forums. take the BBCode if you are going to use it in a forum. 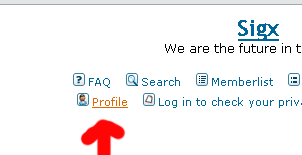 Step 6: go to your forum and hit profile. 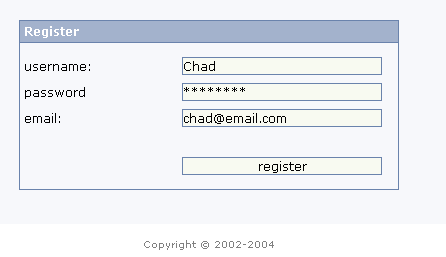 (phpBB is used for this sample). 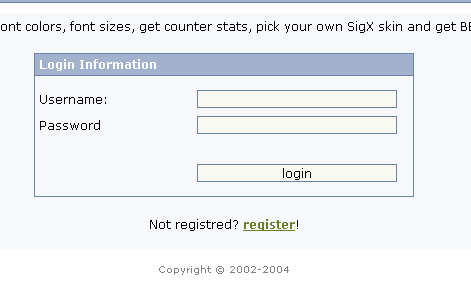 Step 7: scroll down to your signature text area and paste in the BBCode you got from where you choose your theme. 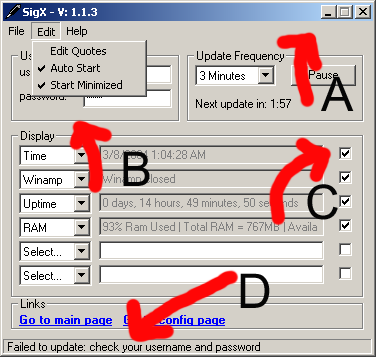 (A) Always remember to minimize SigX so it runs and updates periodically. (B) I have mine to start automatically when windows starts and also starts minimized. You can also setup random quotes through the random quote editor. 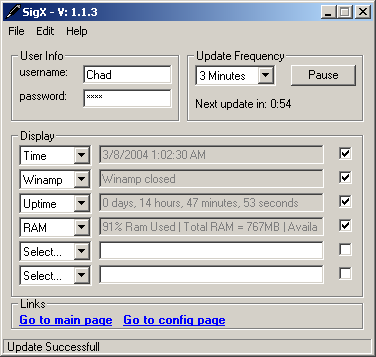 (D) The status bar will tell you if you mistyped your username or password and if the update was successful. ItÆs about 2 AM as I'm writing this, so there might be some stuff missing. I hope this helps you guys who are having trouble getting started. If something is not right, just PM me and ill fix it. If you still cant get started just browse around the forum and if you donÆt find the help you need, just post a new question and ill help ya. Last edited by admin on Tue Mar 09, 2004 11:06 am, edited 1 time in total. Well this will help the SuperNewbs out. Not a bad step by step. are you sure you read step 1? [size=7]is there anyway to make the Winamp section into a different Media Player? Post subject: what do i use to open it with? what should i open it with? 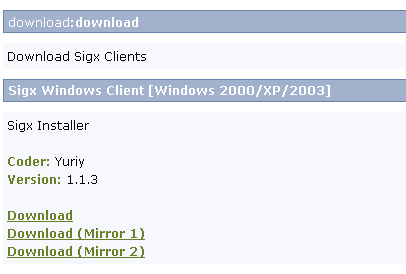 any idea when WMP support will be added? as i use WMP as my primary music player. by the way excellent work on this! i have been looking for something like it for ages! Post subject: Re: what do i use to open it with? can anyone tell me? x.x i need to download the program! just checking out to see if my sigx looks alright.